We hope that by making this manual downloadable for free that more Papua New Guineans will be able to gain the skills they need to conduct valuable research on our magnificent flora and fauna and that they will help in the effort to ensure that our forests and wildlife live long into the future. Here we present the first in what we hope will be a series of field manuals for biological research in Papua New Guinea. Mack, A. L. and D. D. Wright. 2011. Training Manual for Field Biologists in Papua New Guinea. Green Capacity Publication One, USA. The Biological Field Research Training Manual is a free PDF download from our site, our sister site PNGIBR, or Conservation International. This training manual covers safety, basic skills for field research, plus field techniques for plants, birds, mammals, herpetofauna and insects. In addition it covers sampling and experimental design, graphing, data analysis and non-parametric statistics, proposal writing, how to write a scientific paper and how to prepare an oral presentation. Download Training Manual for Field Biologists in Papua New Guinea. 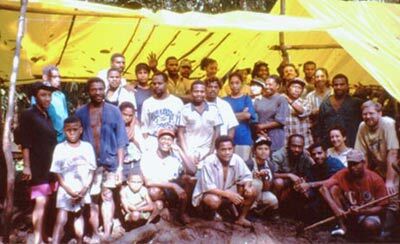 The first draft of the manual was written in 1996 and it has evolved over the years, being field tested by hundreds of students on our annual training courses held in PNG rainforest. It has greatly benefited by input from co-instructors, and from the donors and landowners that made the courses possible. We hope you will find it useful.